You can search the full Culture Crime News media database at news.culturecrime.org. UK museum security and management folks: We want to hear from you! We’re conducting a pilot project about museum security preparation and training and we’d like speak to people who are making museum security decisions in the UK. Is that you? Are you in UK Museum Security or Management? Are you up for a quick phone or email chat about it? Email me! The target is said to be forgeries on the dark web, but who is buying art on the dark web? How transparent is the art market? Digital sharing makes it easy to both steal art ideas and detect intellectual art theft. Were digging for antiquities beneath their home in Assiut. To that this is harsh is an understatement. In response to the various thefts they’ve suffered lately. The underwater site has shown evidence of looting before. Stolen nearly a week after easter, the valuable crown had inlaid diamonds. Everyone agrees it was stolen from a church in Hidalgo in 2007, but what will happen to it next? New surveillance cameras had already been installed in the church. Despite continued threat to looting of Maya sites, the archaeology budget for the state is being slashed. Allegations that the sites aren’t registered or cared for properly with locals having to effect protection themselves. The piece probably wasn’t intentionally stolen and the school district, for now, is letting it stay in the museum. Rep. William Lacy Clay of Missouri showed the painting that had previously been removed in what some see as political censorship. Police have identified a suspect in the theft of the large arrowhead sculpture, they just can’t find him. Alleged Idaho museum thief is in custody, facing felony charges. Khan and Lautt used forged documents that they said were from the government of Pakistan to illegally import looted antiquities. Gelila Mesfin, an artist and student from Ethiopia, feels she is under attack from Chris Devins who apparently stole her design for a mural. The museum is located in the Naples, Florida, Municipal airport. The article implicates a museum volunteer in the disappearance of the items. “Léone Meyer’s biological family died at Auschwitz. She survived.” And she found this painting in Oklahoma via a blog post in 2012. Bartholomäus van der Helst’s “Portrait of a Man”, claimed heirs of Adolphe Schloss. In other words they have bowed to pressure but are not willing to say they are not the legal owner of the work. Located in a Düsseldorf auction house, the icons will be repatriated soon. WWII complications in Europe’s art world. Obviously the police fear the piece has been or will be melted down. More on the Guelph Treasure dispute. This is after a bit of a scene at the Louvre. Good luck! The men gained the dealers trust through several visits to Monza. Thieves posed as legit buyers in a meeting in downtown Monza. They said they were going to make coffee and then walked off with the paintings. Sale of the collection in London in 2014 has now triggered a criminal investigation. Well, maybe it was. It’s a Daily Mail story so hard to pick much out of this. Nicholas Roerich Museum says the raid is part of a state effort to seize control of its collection. A cross worn by the Virgin de la Fuensanta was stolen in 1977 but recovered last year. A regular visitor to the chapel noticed the historic piece was missing; some speculate it was specifically targeted. He stole the identity of a dead art expert to produce fake lithographs. Bern will receiving 200 artworks from the controversial collection within the next few weeks. The 6 foot stone Shona sculpture was taken from a property in Alyth. Great Tapestry of Scotland’s Rosslyn Chapel panel was stolen in 2015. Feature on the forensic archaeology work of Dr Christos Tsirogiannis. Besides the paintings, a large amount of jewellery was taken from the property in Penicuik, Midlothian; a 19th century painting of a piper was taken in another incident near East Linton. The Piper to the 2nd Marquess of Breadalbane by JM Barclay has been taken in the most Scottish art theft possible. The men were found guilty in 2016 of faking Brett Whitely’s so this is a surprise verdict. Same man boosted a painting from the Auckland Art Gallery among many other crimes. This isn’t a heritage theft case but the site has over 100 security personnel and yet this guy got in. Something to consider. Nagpur University coin theft case seems to be going nowhere. 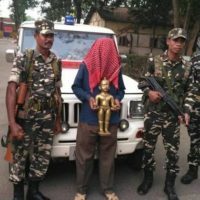 Man arrested said that the idol would go to Nepal then out on to the international market. Because the idols have been lifted, the Chitra Pournami festival has been cancelled. Second time in two months that the temple has been robbed of the same pieces which cover the foreheads of idols. A Shiva and a Vinayaga were stolen from a temple near Sankarankovil railway station. Digital preservation is seen as a way to deal with damage or theft. The true owner of the carpet has not been located. It will be interesting to see what comes from full survey of the site. The column drums have been left by the sea, not transferred to a protected area. Insecurity and theft at sites is everyone’s fault. Thought to have been taken from Gallipoli, the Guennol Stargazer is likely to be the subject of legal action for return. The disputed stargazer sold for $14.5mil but it may not be gone quite yet. Yemen’s national museum lacks electricity due to conflict. Tusks are melting out of Russia due to global warming, but does maintaining the demand for any ivory put living elephants at risk? He left the Lucio Fontana in the back of a cab and walked away. They located the taxi and the Fontana. Huzzah. Museums and Unis: secure your antique horns. They will be targeted.